هذا المقال عن 1808. إذا كنت تريد the book by Laurentino Gomes، فطالع 1808 (book). سنة 1808 (MDCCCVIII) كانت سنة كبيسة تبدأ يوم الجمعة (الرابط يعرض التقويم كاملاً) التقويم الگريگوري، السنة 1808th بعد الميلاد (م)، السنة 808th في الألفية 2، السنة 8th في القرن 19، والسنة 9th في عقد 1800 بين 1583 و 1929 ومع فارق 1808 is 12 يوم عن التقويم اليوليوسي، والذين ظلوا مستخدمين حتى التحول الكامل إلى التقويم الگريگوري في 1929. January 1 - The importation of slaves into the United States is banned, as the 1806 Act Prohibiting Importation of Slaves takes effect; African slaves continue to be imported into Cuba, and until Cuba abolishes slavery in 1865, half a million slaves will arrive on the island. January 12 - The organizational meeting leading to the creation of the Wernerian Natural History Society, a former Scottish learned society, is held in Edinburgh. January 12 - John Rennie's scheme to defend St Mary's Church, Reculver, founded in 669, from coastal erosion is abandoned in favour of demolition, despite the church being an exemplar of Anglo-Saxon architecture and sculpture. January 22 - The Bragança Portuguese Royal Family arrives in Brazil, fleeing from the French army. January 26 - Rum Rebellion: On the 20th anniversary of the foundation of the colony of New South Wales, disgruntled military officers of the New South Wales Corps (the Rum Corps) overthrow and imprison Governor William Bligh, and seize control of the colony. February 2 - French troops occupy the Papal States. February 6 - The ship Topaz (from Boston April 5, 1807, hunting seals) rediscovers the Pitcairn Islands; only one HMS Bounty mutineer is still alive, (John Adams), who is using the pseudonym Alexander Smith. February 11 - In Wilkes-Barre, Pennsylvania, Jesse Fell becomes the first person in the world to burn anthracite coal, as residential heating fuel. March 1 - The slave trade is abolished by the United Kingdom in all of its colonies, as the act of January 22, 1807 takes effect. March 8 - Brazil: With the arrival of the Portuguese royal family in Brazil, the colony becomes the seat of Portuguese Empire. March 11 - Russian troops occupy Tampere. March 13 - Upon the death of Christian VII, Frederick VI becomes king of Denmark. The next day (March 14), Denmark declares war on Sweden. March 19 - Charles IV of Spain abdicates in favor of his son, Ferdinand VII. April 16 - Troops under Colonel Carl von Döbeln clash with Russian troops, in Pyhäjoki, Finland. May 2 - Peninsular War: The people of Madrid rise up against the French troops. June 12 - Finnish War: A landing of Swedish troops at Ala-Lemu, near Turku, fails. June 19 - Finnish War: A second landing of Swedish troops at Ala-Lemu fails. Finnish War - Battle of Turku: The Swedish archipelago fleet defeats the Russians. July 5 - Wooster, Ohio Established by David Wooster from Connecticut. July 8 - Joseph Bonaparte approves the Bayonne Statute, a royal charter intended as the basis for his rule as King of Spain, during the Peninsular War. July 14 - Finnish War: Swedish troops under Colonel Adlercreutz force the Russians to withdraw in Lapua. July 22 - Battle of Bailén: French General Dupont surrenders to Spanish irregular forces. August 10 - Finnish War: Swedish troops under Carl von Döbeln defeat a Russian attack in Kauhajoki. August 17 - Battle of Roliça: An Anglo-Portuguese army under Sir Arthur Wellesley defeats an outnumbered French army, under General Henri Delaborde. August 21 - Battle of Vimeiro: British troops under Sir Arthur Wellesley defeat the French under General Jean-Andoche Junot. September 13 - Finnish War - Battle of Jutas: Swedish forces under Lieutenant General Georg Carl von Döbeln beat the Russians, making von Döbeln a Swedish war hero. September 27 - The Congress of Erfurt, between the emperors Napoleon I of France and Alexander I of Russia, begins. September 29 - Finnish War: A truce is declared between Swedish and Russian troops in Finland; it ends on October 19. October 6 - English chemist Humphry Davy electrochemically isolates potassium from potash. November 8 - United States presidential election, 1808: James Madison defeats Charles C. Pinckney, winning 122 electoral votes to Pinckney's 47. Ten of the 17 states choose their electors by popular vote, the rest choose through state legislatures. George Clinton, who is separately elected as Vice President, gets six electoral votes for President. 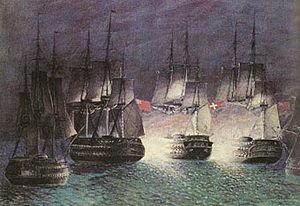 November 12 - Four large French frigates under the command of Jacques Félix Emmanuel Hamelin, including the Venus, are sent to operate from Isle de France (Mauritius) against British trade in the Indian Ocean, triggering the Mauritius campaign of 1809–11. November 15 - Mahmud II (1808–1839) succeeds Mustafa IV (1807–1808), as sultan of the Ottoman Empire. November 19 - A new truce at Olkijoki ends fighting in Finland, and Swedish troops concede that area to Russia. November 23 - Battle of Tudela: French Marshal Lannes defeats a Spanish army. December 1 - Tsar Alexander I of Russia proclaims Finland a part of Russia. December 4 - Napoleon joins his army in Spain. December 9 - At 20:34 UTC, Mercury occults Saturn (there are no observation records). December 20 - Peninsular War: The Siege of Zaragoza begins. December 22 - Beethoven concert of 22 December 1808: Ludwig van Beethoven conducts and plays piano in a marathon benefit concert, at the Theater an der Wien in Vienna, consisting entirely of first public performances of works by him, including Symphony No. 5, Symphony No. 6, Piano Concerto No. 4 and Choral Fantasy.